Why Do School Buses Have Security Cameras? Not long ago, the idea of cameras in public places, cars and school buses seemed like science fiction. However, in today’s world, surveillance cameras provide a much-needed service to society. In many cases, the presence of a surveillance camera is enough to deter unruly behavior and prevent bullying or harassment on school buses. Imagine you have a choice to send your child to school on Bus A or Bus B. Bus A has a surveillance camera that is set to record every morning and afternoon while Bus B has no camera. Which would you choose? Given the fact that 1 out of 4 students is bullied, you would be right to send your son or daughter to school on Bus A. Protecting your child: School bus drivers carry very precious cargo and therefore must remain alert and focused on safe driving. They cannot take their eyes off the road every time there is a ruckus in the back of the bus. As a parent, you probably know that any child can sometimes be rambunctious. When a child is physically or emotionally harmed while riding a school bus, surveillance cameras can help determine the circumstances of what led to the harmful behavior. 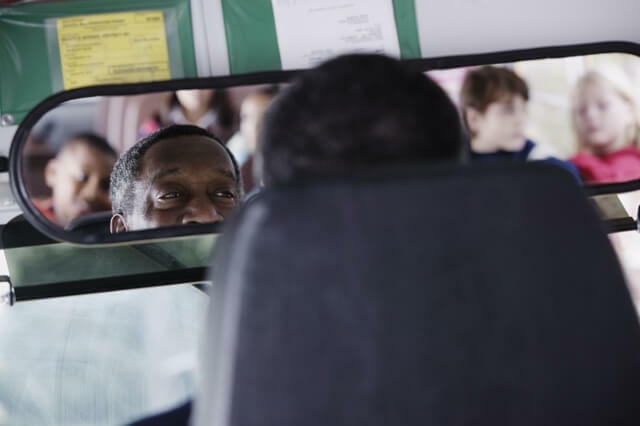 Preventing bus driver harassment: In a perfect world, there would be no need for surveillance cameras and the integrity of school bus drivers would never come into question. Unfortunately, there have been cases of inappropriate behavior, yelling and harassment of school bus drivers by passengers, and vice versa. Video cameras capture the driving ability, language and other actions of drivers to ensure your child is in the hands of a responsible and caring professional. Avoiding traffic accidents: Video cameras may also be installed on the dashboard, front or rear of the bus to record the actions of other drivers. For example, by law, motorists must yield to school buses that have stopped to pick up or drop off passengers. An outside camera can record a motorist who disregards this law and endangers the lives of the children in and around the bus. Many states are starting to use camera systems which operate similarly to red light cameras — they focus on the license plate of drivers who disregard the flashing red lights and stop arm of the school bus. Like red light traffic cameras, these devices record the offender’s vehicle information in a database to help track and issue tickets to those who disregard school bus safety. Determine who is the bully and who is the bullied: The last thing you want to hear as a parent is that your child is the victim of bullying. But how would you react to someone accusing your child of being the bully? When accusations fly and arguments become muddled with he said/she said, surveillance cameras unveil the truth. You may recognize the need for cameras on school buses to improve school bus safety, protect your child from bullying, and to monitor the bus driver. But did you know that cameras can also capture vital information regarding the condition of the bus itself? In the terrible event of an accident or fire on board the bus, doors and windows must be in proper operating condition to allow safe and immediate evacuation. Surveillance cameras can reveal damage to seats, windows and rear and front doors. Damage to any component of a school bus is a safety concern which must be addressed prior to use — video cameras ensure the vehicle your child rides in is up to code and properly maintained. While the primary function of school bus surveillance cameras is to protect children, they can also capture the actions of good Samaritans and modern-day heroes. Take the case of Dave Cooke, a Texas school bus driver threatened by an aggressive woman who demanded entry onto the bus. As the woman became more agitated and attempted to board the bus, Mr. Cooke told one student what button to push to close the bus doors as he prevented the deranged person from boarding the vehicle and harming the children. Mr. Cooke’s actions and cool demeanor under pressure were captured, thanks to the cameras on board the school bus.